For the second consecutive year, the Italian came out on top at Germany’s only World Tour race. 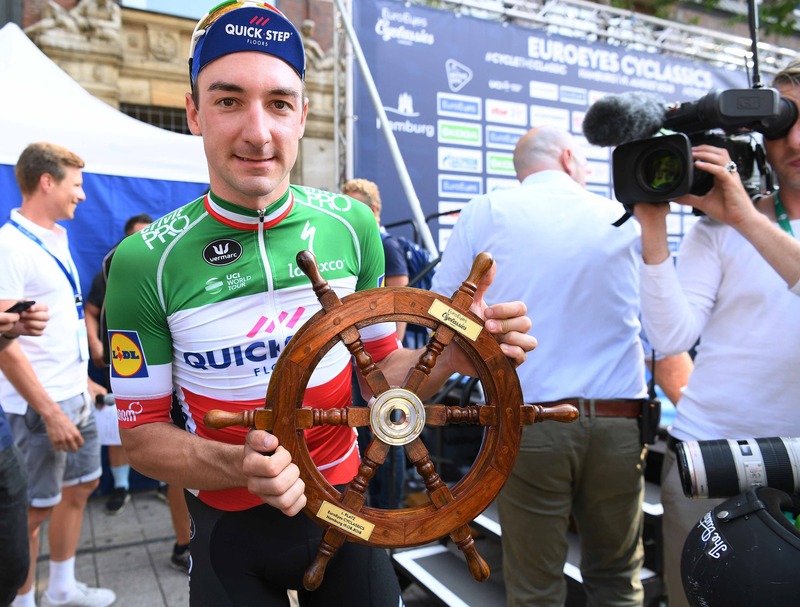 Elia Viviani took his first success in the national champion jersey, which he conquered in Darfo Boario, seven weeks ago, at the 23rd EuroEyes Cyclassics Hamburg, where he became just the second rider in history to win the one-day race twice. Just like in 2017, Viviani outsprinted Arnaud Demare (Groupama-FDJ) after jumping from the Frenchman’s wheel where he was left following a long and impressive lead out of a strong Quick-Step Floors delegation consisting of Michael Mørkøv and Fabio Sabatini, in a hectic finale disrupted by a crash occurred with 1500 meters to go. “I was second in the Cadel Evans Race, Gent-Wevelgem and RideLondon, so to finally win a World Tour one-day race this year feels incredible. It’s also my first victory in the beautiful maglia tricolore, which is something special that I will remember for the rest of my life”, a delighted Elia said after netting Quick-Step Floors’ 55th success of the season. The 216.4km-long race was animated until the last 20 kilometers by a five-man breakaway group which took off minutes after the start, only to get reeled in before the third and final ascent of the 400m Waseberg hill, whose 10% average gradients were used by some riders as springboard in a desperate attempt to foil the sprinters’ plans, only for the teams of the peloton’s fast men to dully control the gap and nullify the move inside the last six kilometers. Davide Martinelli, Michael Mørkøv and Fabio Sabatini formed a high-speed lead-out train for Elia Viviani, drilling the pace at the front from three kilometers to go and stretching the reduced bunch as they kept their leader in a good position, from which the Italian capitalized on Quick-Step Floors’ excellent work, taking a dominant victory ahead of Demare and Alexander Kristoff (UAE Team Emirates). “The team did again a perfect and impressive job: Iljo pulled the entire day, in his first race since June, then we had Rémi and Kasper for the hilly part of the race, where they kept things together, before Davide, Michael and Saba took over. We studied the closing part of the race yesterday evening and knew we had to be in the front for the last three kilometers, which were really technical. It’s a pleasure to be part of this team, the best in the world, and I feel really luck to be a member of the Wolfpack”, said Elia, before taking us through the last kilometer. “With 400 meters left, I was on Demare’s wheel, who had Guarnieri in front of him, and that was the best position to find myself in. All that I had to do was to wait for the best moment to launch my sprint and power past my opponent, and this was inside the last 150 meters, 50 meters later than in 2017. 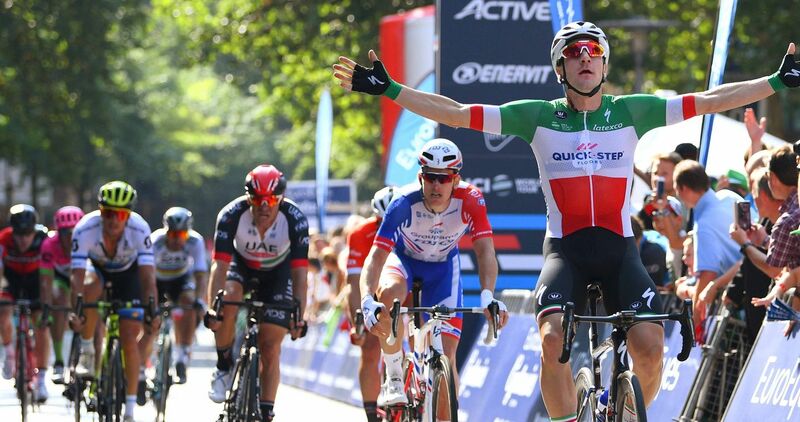 Getting this victory bodes well before flying to Spain next week for La Vuelta”, concluded the 29-year-old Italian, who tops the individual win classification this season, with 15 victories to his name.